Hello, lovelies! Today I have some nail art over Orly Vintage, which I showed you yesterday. So here is the inspiration for this mani. I decided these would look pretty cool with the outfit I had in mind, very light colored denim skinnies, a tight black ballet style top and fresh, white Chucks. I knew I was going with Orly’s Vintage because it just added a cool effortlessness to the outfit. But, if you’ve been following me since before the blog, you know I can’t leave well enough alone! I did some double stamping using Winstonia plate W405 from their 4th generation stamping set. The polishes I used are Born Pretty’s silver stamping polish and Gothic Gala Lacquer’s Basic Black. I kind of like that they don’t really line up properly. It sort of lends it a carefree attitude. After stamping, I added some tiny silver triangle studs. Those are also by Born Pretty. If you wanna grab anything from them, you can use my code – LESLIEW10 for 10% off of your order. I’m really satisfied with the overall effect! A little sloppy mixed with a little “I don’t care”. The stamping you added to this is perfect! That hint of metallic is lovely! I agree, it looks very carefree and casual yet still put together. They look great! Oh I love the double stamping! It’s perfect. I really dig those earrings! Perfect stamping, turned out lovely! 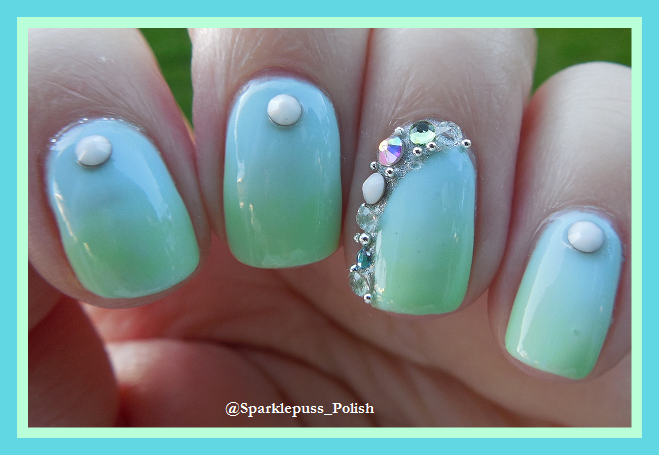 love the earrings and the mani! This is really cute – I love double stamping! These match the earrings perfectly!